When I reflect back on my days a younger Catholic mom, one of my fondest memories is the role that the magazine Catholic Parent played in our Domestic Church. I remember reading Editor Woodeene Koenig-Bricker’s reflections each month and feeling not only inspired, but also completely supported in my vocation. And I needed a lot of support back then, when I was faith-parenting on my own prior to Greg’s conversion to Catholicism. I also remember the very first (and only) time I met Woodeene Koenig-Bricker in person. I was at a book signing at the Cathedral in Los Angeles, and she came forward and introduced herself. I’m sure she though I was nuts that day — I could barely contain my excitement at meeting someone whose words had played such a critical role in my own faith journey. She was gracious, and our friendship has blossomed these past few years online as she’s generously shared her expertise, wisdom, and support. 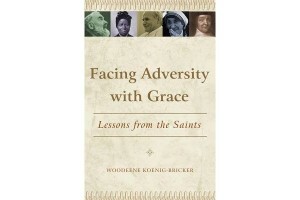 With Facing Adversity with Grace, Woodeene Koenig-Bricker moves beyond platitudes and holy card images to give us a true, in-depth look at the spiritual wisdom of the saints. Whether you face struggles and bear crosses in your own life or you seek to support a loved one who is suffering, Woodeene points you to the perfect spiritual companions to deal with a variety of challenges. Hearing their stories, relating them to our own times, pausing to reflect on Woodeene’s reflection questions, and praying in union with the communion of saints can and will lead us closer to God and towards healing. I thank Woodeene for giving me new insight into several of my favorite spiritual giants and highly recommend Facing Adversity with Grace for any spiritual seeker. Today, I’m pleased to share my recent conversation with Woodeene Koenig-Bricker and urge you to add this book to your spiritual library. You’ll be blessed by Woodeene’s words and by these important lessons from the saints. Q: Congratulations on the release of this wonderful book Woodeene, and thank you for joining us today. Please briefly introduce yourself to our readers. Thank you, Lisa, for the chance to connect with your readers. I’ve always found it a bit hard to talk about myself because my background is in journalism and I still have the tendency to think about being the one asking the questions, not the one being asked, but I’ll give it a try. I’m a life-long Catholic, having gone through 12 years of Catholic school. Most of my life I’ve worked in various facets of Catholic publishing, including being the editor of Catholic Parent magazine and the author of several books, mostly on saints, including this one and 365 Saints which is a saint a day book. I live in Oregon (but dream of desert climes! ), and work at learning to speak French just in case God decides that I should be able to live in Provence for awhile and I love good dark chocolate! Q: Please briefly tell us about Facing Adversity with Grace: Lessons from the Saints. What will the readers find in this book that makes it different from other books on the lives of the saints? What my hope was in writing this book was to show readers that the saints experienced the same sorts of trials and suffering that come to all of us and give modern readers hope and encouragement in their own times of trial. All too often, lives of the saints give the impression that when faced with really hard things like illness, financial problems, divorce, mental suffering etc. the saints all go, “Woo Hoo!!! More suffering. Yippee. Bring it on, God!” In truth, most saints don’t enjoy their struggles any more than you or I do. They suffer, truly suffer. But what they do is use their suffering both to transform themselves and to learn lessons…like patience and trust and humility. So I selected some saints who are very familiar, like Teresa of Calcutta, but tried to show how they dealt with suffering we might not associate with them. In Mother Teresa’s case, it was the mental anguish that came from living most of her life in a “dark night” of the soul. In other cases, I looked for a situation that is common to use today, like divorce, and then looked at how a saint dealt with that situation. In the case of divorce, I chose St. Helena, who I think should be the patron of the “First Wives’ Club” since she was dumped for a trophy wife nearly 2000 years ago! Talk about a modern problem and an ancient saint. What I hope makes this book different is that I tried to tell the story of the saint and how he or she coped with their suffering so as to offer us models for dealing with similar situations without resorting to holy hagiography. Q: Why this book at this time in your life? I have long been intrigued by the difference between the romantic picture we often have of saints and their actual lives. I found their real lives to be so inspirational, I toyed with the idea of writing about their struggles and how they dealt with them for several years. Then, in one of those convergences of grace and life, I began writing as my mother was entering the last year of her life and I was her caregiver during a very long journey. I saw the kind of suffering she experienced and the sort of suffering that I was going through and began to look for examples of saints that I might use as models and prayer guides. When I finished writing it, I remember praying, “Was it really necessary that I experience EVERY ONE OF THESE THINGS FIRST HAND?? ?” Interestingly, since there is always a lag between finishing a book and its publication, now, as I read what I was writing a year ago, I can see that I was actually talking to future self in many cases. So the answer to why this book at this time is because God knew that both in the writing and now in the sharing of it and its stories, there was grace to be had. Q: What did you learn in the writing of this book? One thing I learned is that I’m a wimp when it comes to suffering! But more seriously, I learned two things: first, you have to look at the saints in the context of their culture and their times before extrapolating a direct lesson. There are some saints who did things in the name of suffering, like my patron Rose of Lima destroying her beauty with lye, that would get them put on heavy duty drugs today, but in their time and culture, their actions were seen as signs of holiness. Unless you understand what the culture saw as holy, you can’t understand her actions. That’s true for many, if not most of the saints. You have to know their time and place before you can understand their actions. The second thing I learned is that there is always a lesson involved in our suffering and adversity. It rarely does us any good to ask “Why me?” or “Why did this happen?” Instead, we are to ask, “What am I supposed to be learning from this?” There is always a lesson to be learned, if we are willing to accept it. It may not be the lesson we expect, but there is something we are to take from our adversity in order to grow spiritual and to assist others. Q: Of the saints you write about in this book, do you have a personal favorite? What have you learned from that saint that has inspired you in facing your own adversity in life? I really love St. Helena. Her story is just so modern. A barmaid falls in love with a general, who rises through the ranks to become Emperor and then she gets dumped for a younger, more politically correct woman and has to reinvent herself in her “old age.” Sounds like a made for TV movie, doesn’t it? So often we face situations that upset our entire world. It might be divorce as with Helena, but it could be any of a number of things, like illness or death of spouse or child, but just when we think everything is all set and we can live “happily ever after,” we are forced to do things we don’t want to do…forced to become someone new. That’s the lesson of Helena that inspires me. As I said, I had been my mother’s caregiver for nearly 14 years and upon her death at the end of January, I’ve found myself sort of adrift. So much of my energy and resources had been focused on her, once she was gone I’ve been forced to try to figure out what comes next for me in many areas–personally, emotionally, financially, career-wise, location. When I feel sort of overwhelmed by it all, I think about Helena and what she had to do when, by the standards of her time, she was a very elderly woman. And what she did was quite remarkable–go to the Holy Land in quest of relics of the crucifixion, establish churches and become a great philanthropist. I find Helena’s story particularly comforting right now. Q: You specifically mention in your introduction that you stay away from certain saints — why this decision and is there any saint you would have liked to have included but didn’t? I tried to stay away from saints whose understanding of adversity and suffering is so rooted in their time and place that it is difficult for modern readers to identify with them. For instance, my own patron, Rose of Lima. It would be hard for most of us to see how disfiguring your face and inflicting wounds on yourself isn’t a sign of mental illness. I mean if someone today was a cutter or used lye on her face, she would be put under medical care. In her time, the idea of destroying anything, including your physical appearance, that might lead you or someone else to sin was considered a brave and holy virtue. So Rose’s actions were seen in a very different light. There are many other saints, too, who made choices that just seem odd to us today and rather than try to find a way to explain their behavior so as to be an example for us today, I just stayed away from them. As for not including a saint, I’m happy with the selection, although I think that there are a few other types of suffering that I would have liked to have added–perhaps suffering from the inability to have children or from the aftermath of abortion or from frustrated dreams and desires, but perhaps those are fodder for another book. Q: In an age when life feels so busy and complicated, what are some of the most important coping skills and strategies that we can learn from the lives of the saints? Oh good question! One is that we need to find a place within where we can be calm and still because the lessons we learn from adversity aren’t generally found in noise and rush. We have to take the time, especially when it seems like we have no time, to sit with God and figure out what it is that God wants to teach us. Another thing to learn is that we can and should use practical as well as spiritual solutions when needed. Padre Pio used modern medical treatments, for instance, not just prayer for some of his physical ailments. We pray first, of course, but then we see if there are ways to deal with our adversity that are rooted in the here and now as well as the miraculous. Finally, the saints teach us that suffering comes to us all, but God does not delight in our pain. Jesus did not come to bring “suffering and suffering abundant,” but “life and life abundant.” The purpose of life isn’t to suffer; it is to live as the person God created us to be. Sometimes suffering is the way that we are shaped, but to suffer is not the summit and goal of Christian life. I hope that this book makes a difference for people who think that they are facing things that the saints never had to face. And I hope that it offers some encouragement…and even a bit of humor…for tough times and situations. Thank you for this chance to chat with your readers and if they want to read more of what is going on in my life, I blog at Ordinary Time www.woodeene.blogspot.com. Lisa Hendey, Catholic wife and mom, is the founder and webmaster of www.CatholicMom.com and the author of A Book of Saints for Catholic Moms: 52 Companions for Your Heart, Mind, Body and Soul and The Handbook for Catholic Moms: Nurturing Your Heart, Mind, Body and Soul. Lisa writes for several online and print publications, enjoys speaking around the country and hosts the Catholic Moments Podcast. Visit her at LisaHendey.com.